“Yes, we can strategize. It is an uphill battle as it does require going against the status quo (or at least much of the current status quo). I believe we are moving in that direction and there are two forces that are allowing this move. 1. We are modelling permission to fail. Exploring next practices won’t land on the promising practice the first time. One of my best teaching examples of this was working with a project having students create persuasive videos. They did all the planning, scripting, and recording to a video camera. The last stage was to turn it into a newscast with iMovie. The computers were not cooperating so we tried for 2 blocks and then abandoned the plan. While they were disappointed, all of the learning goals had already been met. 2. Removing hurdles and empowering innovation. The directions we have moved in the District have a strong flavour of removing hurdles. At the same time, we are providing technology opportunities to explore new technology. We have provided loaner equipment for several years. My experience is that once schools dig in and see personally the potential in the classroom, it is just a matter of getting the resources that live in the school to allow further innovation. One of the best moves from the Maine 1 to 1 laptop project was to provide teachers the laptops 1 year before the students. In Surrey we have used a similar model by providing the iPads to teachers 4 months before schools. Can we strategize innovation? Yes. 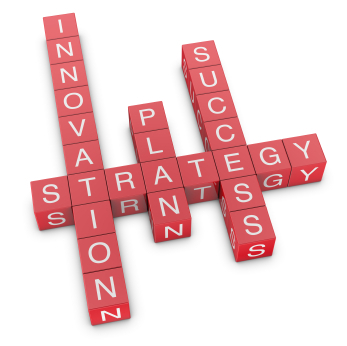 Are we strategizing innovation? Yes. Does strategizing require continuous energy to keep it in motion? Yes. Is the work worth it? Yes. The above is a guest post from Kevin Amboe (@amboe_k), Information Media Literacy Helping Teacher with School District #36. He writes in response to the question in an earlier post that asked the question: Can we strategize innovation? “Writing still matters. Reading still matters. In fact it may matter even more.” Those were some of the key points I took away from our first session of Engaging the Digital Learner, featuring West Vancouver Superintendent Chris Kennedy. Chris’ message wasn’t new to me, I have heard him before but I still found it wonderfully inspiring. One of the things I like about Chris is although he is comfortably fluent in the digital world, he is absolutely grounded in making sure it is all about learning and not about the technology. Chris also spoke about how West Vancouver has placed Teacher-Librarians at the centre of their district’s staff development plan. Teacher-Librarians are key to supporting teachers with digital literacy learning. It makes sense. I like the vision of the Teacher-Librarians as digital literacy champions for both students and staff. “How much “dashboard time” have the teachers received in your district?” (dashboard refers to receiving one-to-one training). I think everyone who left that night felt inspired to learn more. We asked individuals to register with a buddy (or two) in order to connect their learning between sessions. Many tables were forming new groups and seeing it as an opportunity to create a network of learners. I was appreciative of the work of the IML Helping Teachers in organizing such a fabulous dinner series. The team asked me to thank Chris and close the session. 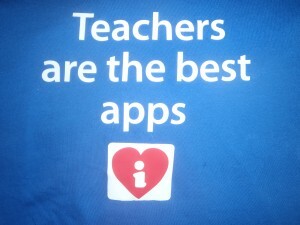 I wore the “Teachers are the best apps” T-shirt that was designed by Helping Teacher Amy Newman. The shirt was significant because the motto really captures our beliefs about embracing technology in the digital era. It isn’t about the tools, it isn’t about the ipads or the ipods or any other shiny device. It is about teachers who know how to make a difference because they know how to stretch the thinking of students. 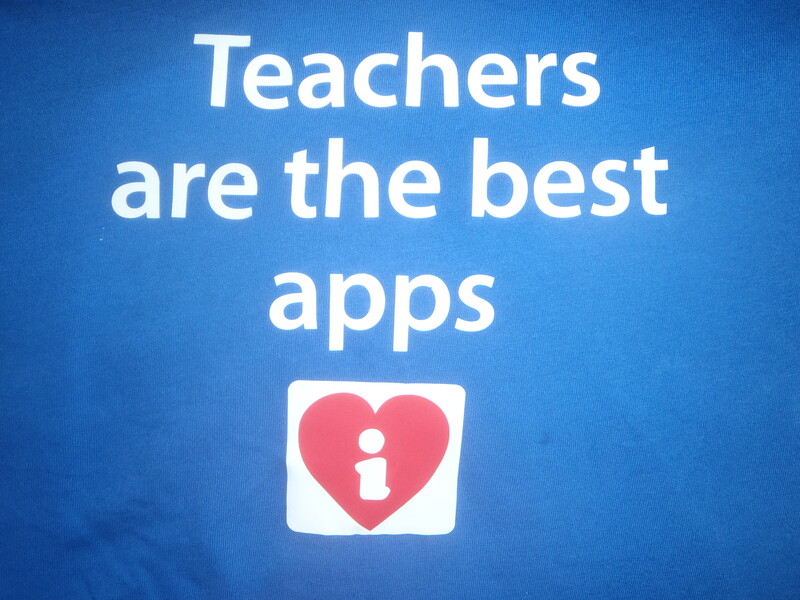 It is about teachers who care about students and are prepared to meet them on their digital ground. Innovation in education can and will take different forms. Leadbeater (2011) refers to five options for strategizing change. Personally, when I read Leadbeater’s ideas, I find I am forced to take a much larger view of education, as if helicoptering above to see it in the grander global context. Some of these strategies identify tactics we already use but others require us to stretch our thinking. His five strategies for innovation are summarized here. Are you using any of these at your school? Develop practices for the future. This is different than best practice (think of it as “next practice”) and is about creating a way of learning specifically designed for the future. Others would take it one step further, where practices intentionally are designed to disrupt the status quo and transform existing educational practice. Leadbeater cites Deming’s quality circles in Japan as a concrete example. In education he gives the example of Cramlington Community College and their “learning to learn” lessons and “blended learning” in the U.S. Are we teaching for the future? Extend innovation beyond the singular classroom to the entire schoolhouse. In this instance, it is not just classroom pedagogy that shifts but whole “classroom design, timetabling, curriculum assessment, student voice.” Models in the private sector include Google, 3M, Apple and Pixar and in the education sector, High Tech High. These organizations include a core set of values (e.g. “making insanely great products”), non-hierarchical collaboration, innovative capacity honored across the organization, strategic hiring, and incredibly high standards (including peer-to-peer reviews). Which characteristics are evident in your school? Create educational innovation as an interconnected system or platform of complimentary services. Think of Apple’s iPhone or iPad and its complimentary iTunes service. The two work together. In education, we embrace this notion in small ways when we look to outside experts, volunteers or work experience opportunities for students. Are there scaled up ways we could implement the platform notion? Are there existing partnerships that could be leveraged to provide greater system-wide support? Design innovation through alliance building. Create a social network that is committed to creating innovation as a social change movement. This is bigger than the platform approach and is best understood as, “a contest between an old order and a new one.” How does an educator’s use of social media and twitter fit into this context? Establish an innovative culture that changes the current ideology. “It means encouraging people to adopt a different point of view and different behaviors to see products in a different light.” Apple used this strategy when it created the anti-corporate message: buy our products and become part of the anti-establishment. Nike was not so much about great shoes as it was about “just do it.” So what are the ideas about education and learning we need to change? “If…innovation in education is about confronting and dislodging entrenched ideologies about learning,” we need to have some agreement about those entrenched ideologies. Are you having this conversation? And how might this dialogue change what we do? Do we have any experience using these strategies in our schools? Have we identified the gap between what we have and what we need? Can we open ourselves to a more collaborative model of innovation with those inside and outside the system? How can we deploy the five strategies to leverage a future for all of us? What is your next step? This post is adapted from Charles Leadbeater’s article Rethinking Innovation in Education: Learning in Victoria 2020 (Draft January 2011). Thanks to Superintendent Mike McKay for sharing this article as one of his assigned readings for the Global Education Leaders’ Program.